Marvel’s Secret Wars event literally ripped the publisher’s comic book universes apart, stitched them back together into an insane patchwork dystopia, and ended with characters from Marvel’s Ultimate Universe like Miles Morales ending up in Marvel’s primary 616 universe, where all the action happens. 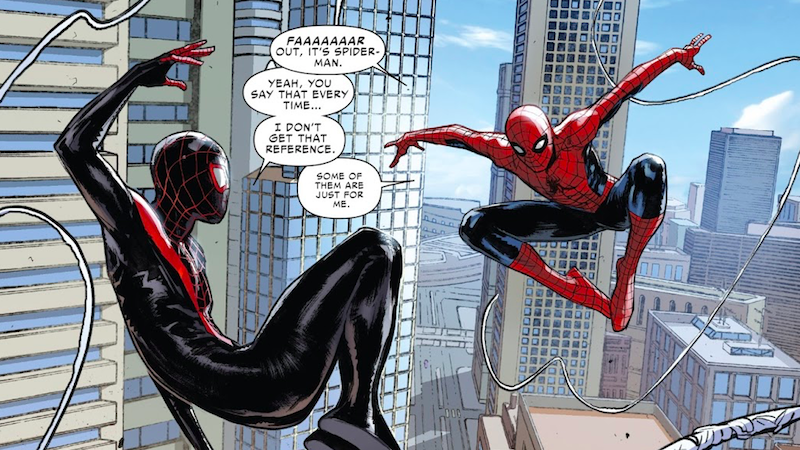 While bringing Miles into the main universe was a dream come true for fans who felt as if he deserved a shot at running around in Marvel’s flagship titles, his introduction into the 616 universe came with all sorts of interesting quirks. Miles has had to figure out how to fit into this new world that’s so unlike his own. Perfect example: In 616, Peter Parker—who was dead in Miles’ universe—is very much alive and still using the Spider-Man moniker that Miles had become accustomed to. The two Spider-Men have had a doozy of a time making sense of their complicated, interconnected pasts since meeting for the first time. But in Spider-Men II, they’re finally digging into the post-Secret Wars, multiversal weirdness that nobody else seems to remember. Though both Peter and Miles are currently going by “Spider-Man,” Spider-Men II opens with a palpable tension between the two after a bunch of bad guys manage to tie them up with their own webbing and escape in an airplane. Miles manages to free them just in time to watch the plane fly away and while Peter doesn’t blame Miles for what happened, he admits that he thinks Miles is too young to fight crime. Where Miles is from, he’s the Spider-Man and despite what Peter might think about his experience level, the plane incident is far from Miles’ first time at the rodeo. But Spider-Men II underscores Peter’s point by immediately cutting to two scenes sometime later: 1) Miles’ civilian life as a high-schooler with all the responsibilities and stresses you’d expect a teenager to be saddled with, and 2) Peter Gùggle-ing “Miles Morales” to see if he ever existed in the 616 universe to begin with. Both Peter and Miles’ time off is interrupted when a dimensional rift very much like the ones that once tore the multiverse apart appears in downtown Manhattan and suddenly chucks up a huge metal orb that crash-lands in Miles’ high school. When the Spider-Men show up to investigate the portal, they’re greeted by a Taskmaster that, presumably, they team up to fight and send back wherever he came from. We don’t get to see the fight, because Spider-Men II cuts to yet another scene somewhere else where a man coming back from walking his dog enters his palatial house and is greeted by a woman who knows about the Taskmaster’s arrival. The man—who is very much a fully-grown man with a face full of gnarly scars—is none other than the 616 universe’s Miles Morales. Not only is this Miles apparently rather well off financially, but he reveals that he swore something to himself “years ago” about super villains, but before he finishes, the issue ends, leaving us with a whole new set of questions. Spider-Men II #1 isn’t really meant to answer most of the questions posed by Miles’ being in the thick of Marvel’s primary universe, but when you zoom out a bit, it’s actually adding him to a part of the Spider-Legacy that was exclusive to Peter previously. Though often we think of Peter’s powers merely coming from a radioactive spider bite, he and all of the multiverse’s “Spider Totems” are connected to a supernatural Spider Deity who orchestrates events on a universal scale. In the past, Peter’s been prominently featured as the focal point of the Spider Deity’s machinations given that most of the alternate universe Spider-Folks that we’ve seen have been versions of Peter or people directly related to him. When he was first introduced, Miles was a radical shift away from Peter, and now it seems as if the center of the macro Spider-Verse is expanding to make room for Miles in an even larger way. Only time will tell just how the events of Spider-Men II play out, but if it means more on-page time (with potential for onscreen time) for Miles, then it can only end well.